Keep the whole family safe with this attractive and lightweight dog tag necklace! Comes with a 16 inch neck chain. Made of aluminum and custom engraved with laser to provide a white finish. 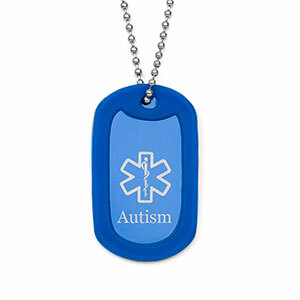 It comes with the medical symbol and Autism pre-engraved on the front. The back has space available for additional Autism condition safety details to be engraved. It makes for a colorful, attractive addition to our Austim jewelry collection! Up to 8 lines of 15 characters each, including spaces! Up to 6 lines of 22 characters each, including spaces!